It's that time again...time to post the winner of the April ePlay Challenge, Wood, hosted by our very own uber creative and talented Sherry Cheever. We were thrilled to have so many participants this time and to see the huge variety of ways you incorporated wood into your projects. It's so exciting to see where creativity takes each one of us! 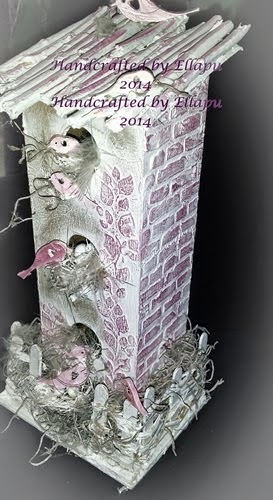 ellapu's birdhouse is wildly creative with so many amazing details. Just look at that roof and the fabulous way she created the bricks. The use of natural materials and repurposing of others is so inspiring. Congrats, Elaine. Please contact Kim at kim@eclecticpaperie.com to claim your $25 gift certificate prize. We also want to make special mention of two more amazing entries for this challenge so that you wouldn't miss them. Julie altered a 2.2 M French farmhouse door to create this stunning piece of home decor. 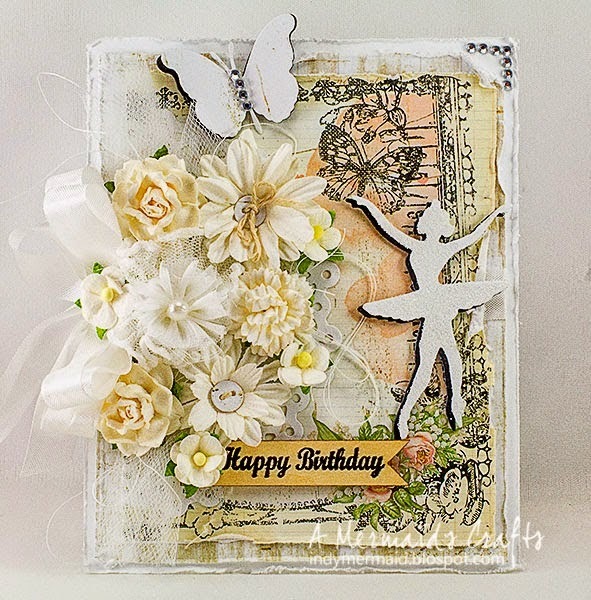 Lisa created this beautiful monochromatic card, brimming with texture and lovely layers. Our current ePlay challenge is hosted by the delightfully imaginative and skilled Erin Smetak who has chosen the theme of Stencils. Check out her wonderful tutorial and gorgeous art journal background here and you will find loads more inspiration in the DT projects found in the thumbnails below Erin's post. We're really hoping you will play along with us for this ePlay Challenge. Congratulations to the winners. Beautiful projects. Congratulations to the Winner and the two special mentions! Absolutely GORGEOUS creations! Congrats to the winners - all are so creative - there were many wonderful wood projects shared for this challenge! Amazing projects by everyone, congratulations! Thank you for your special mention of my door. I missed it as there is yet more wooden items to alter here!